An aerial of the unique formation of this iceberg in the Strait of Belle Isle in Southern Labrador, Canada. 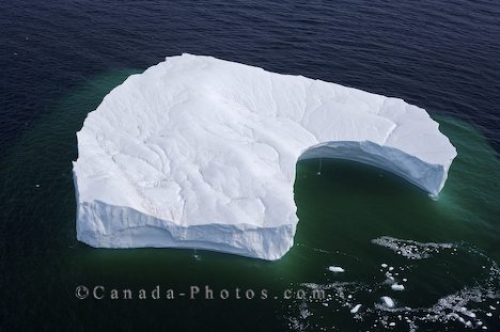 This iceberg starts to breakaway and drop into the ocean leaving this aerial view looking like someone or something took a big bite out of it. Looking down upon this iceberg that floats around the Strait of Belle Isle in Southern Labrador, the formation begins to shrink as the days warm up. Unique patterns form on top of the iceberg while the base drifts below the surface of the water being the last part of the iceberg that will disappear. Aerial of the formation of an iceberg created during its melting process in the Strait of Belle Isle in Southern Labrador.